Probably, wave iv? of (v) of [iii] may be taking the form of horizontal triangle. 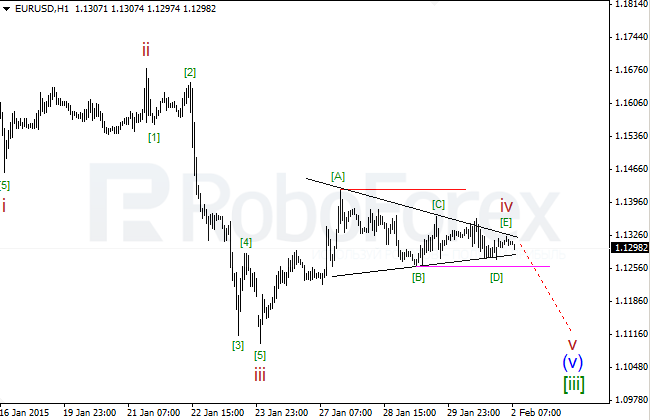 During the next several days, the price is expected to break this pattern and continue moving towards 1.1000. 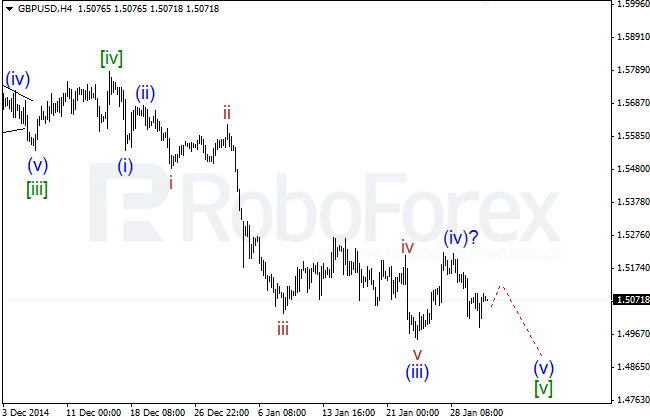 The shape of wave iv of (v) of [iii] had to be changed due to the horizontal movement of the price over the last several days. 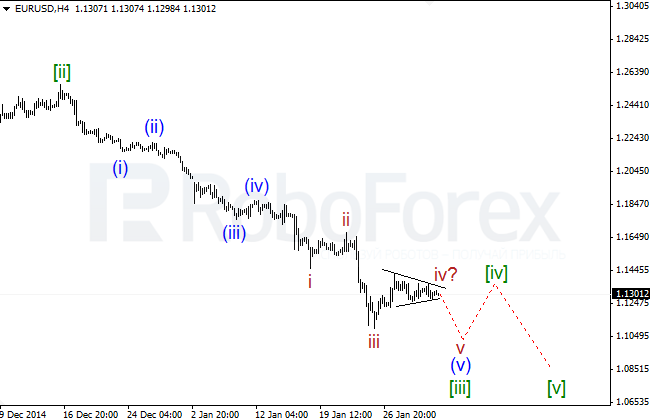 Most likely, the wave is taking the form of horizontal triangle. The critical level is at the top of wave [A] of iv of (v) of [iii]. This scenario may be confirmed if the pair breaks the level of wave [B] of iv of (v) of [iii] (colored in crimson). 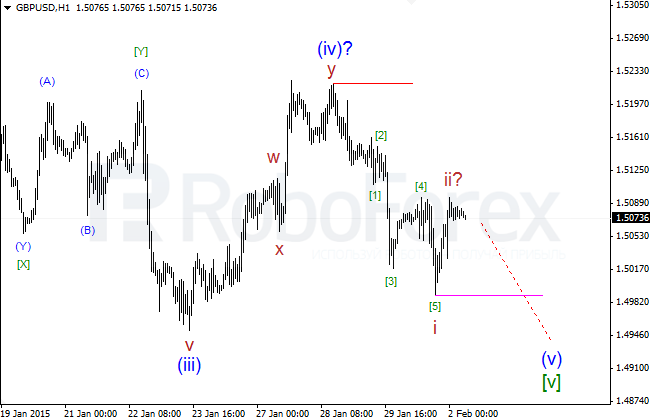 Probably, Pound has finished the first descending impulse of wave (v) of [v]. Possibly, after a slight correction, the market may continue falling according to the main scenario. The scenario, which includes horizontal triangle inside wave (iv)? 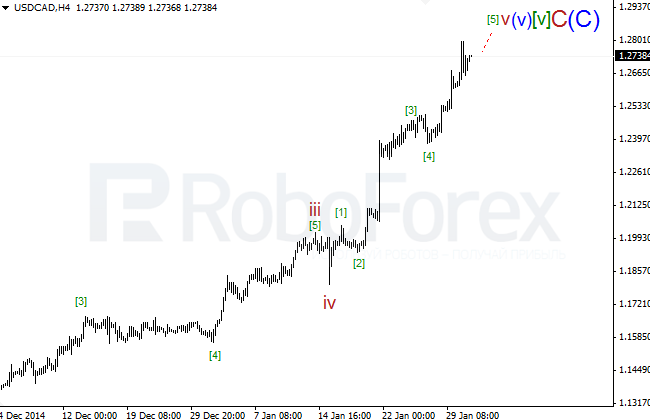 of [v], is no longer in effect, because the descending movement from 1.5218 may be considered as the five-wave structure, and we suppose that this is the first impulse of wave (v) of [v]. The pair is expected to continue moving downwards. 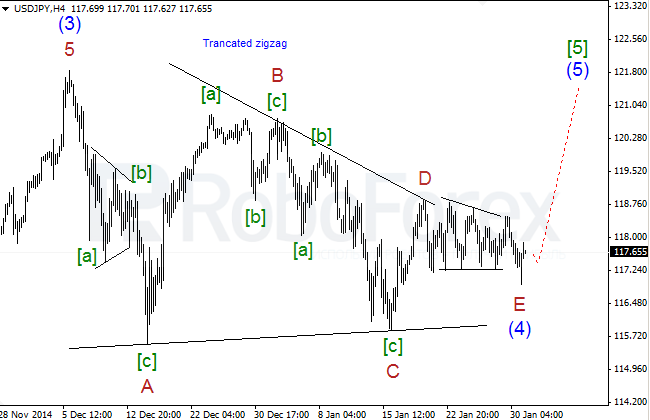 Yen has finally finished the “long suffering” horizontal triangle inside wave (4) of . The pair is expected to leave this pattern upwards. The target of this ascending movement will be at 123.20 (the longest part of the triangle from the start of wave (5) of ). Wave E of (4) of  of horizontal triangle has turned out to be the most complicated one. The market has formed horizontal triangle inside wave [b] of zigzagE of (4) of . This fact explains the narrow trading range, where the pair was moving over the last several days. 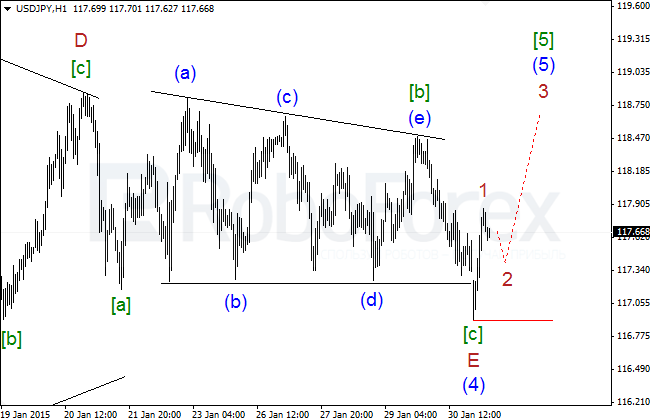 If Canadian Dollar continues moving in the same direction (most likely, it will continue growing), horizontal triangle may be transformed into double zigzag. So, the market is still moving upwards inside a large extension without any signals of reverse so far. 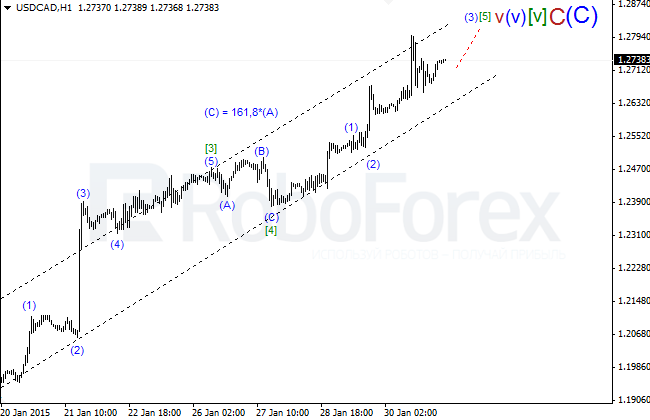 The descending movement of the price from 1.2799 may be considered as a “clear” zigzag, which means that it’s a local correction and the pair may continue growing. Extensions inside wave  of v of (v) of [v] of C of (C) are hard to identify so far. The trend is still bullish.